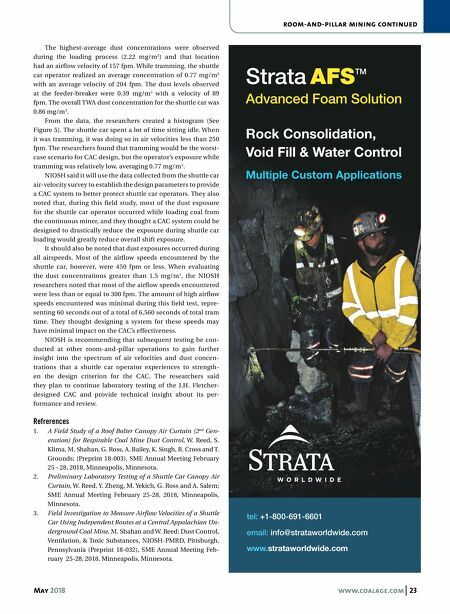 22 www.coalage.com May 2018 room-and-pillar mining continued In the underground environment, the shuttle car CAC would have to work well in high-ventilation airflows to be considered effective. NIOSH defines high-ventilation airflows as the ventilation velocity plus the maximum speed of the shuttle car. Komatsu Mining (aka Joy Mining Machinery) claims that shuttle cars have a top speed of 6 mph or 528 fpm. NIOSH embarked on another field study at a room-and-pillar operation in central Appalachia to determine the air velocities actually encountered while tramming a shut- tle car. The high-ventilation velocity was 283 fpm. Adding that to 528 fpm for the shuttle car, the maximum-ventilation airflow was de- termined to be 811 fpm. In the section, two shuttle cars were used to transport coal from the continuous miner to the feed- er-breaker. The shuttle cars took two independent routes to prevent the cables from overlapping. The mine was using blowing ventilation. Airflow readings were recorded at the coal face and the feeder-breaker using vane anemometers. The scrubber airflow rate on the continuous miner was 7,700 cubic feet per minute (cfm). During the study, NIOSH researchers were placed near the continuous miner, the feeder-breaker and along the shuttle car routes. Each wore personal dust monitors. Dust sampling units were also placed on the shuttle cars and sampling packages were placed inside the cab of the shuttle car. Sampling was conducted for two hours, which included 10 shuttle car passes, representing two complete cuts with the continuous miner. 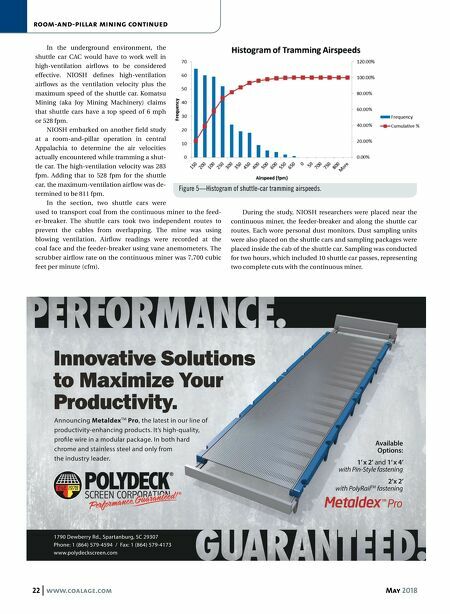 Available Options: 1' x 2' and 1' x 4' with Pin-Style fastening 2'x 2' with PolyRail TM fastening Announcing Metaldex TM Pro, the latest in our line of productivity-enhancing products. It's high-quality, pro�le wire in a modular package. In both hard chrome and stainless steel and only from the industry leader. Innovative Solutions to Maximize Your Productivity. 1790 Dewberry Rd., Spartanburg, SC 29307 Phone: 1 (864) 579-4594 / Fax: 1 (864) 579-4173 www.polydeckscreen.com Figure 5—Histogram of shuttle-car tramming airspeeds.